Sunday 5 July 2010. 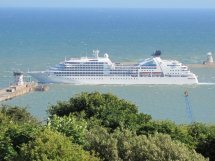 The latest of the Yachts of Seabourn new ships, Seabourn Sojourn, was the destination for a number of lucky Deluxe Cruises Guests who were invited for a ship visit to see the Seabourn Sojourn. Accompanied by Lesley, guests spent the day exploring this wonderful new ship. 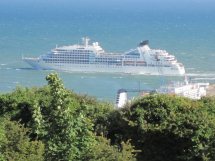 At the end of the day, from a vantage point on “White Cliffs of Dover” Margaret Bell took these super photographs of Seabourn Sojourn leaving Dover harbour on her next voyage exploring the Scottish Isles and Norwegian Fjords. We would like to thank Margaret for allowing us to use her photographs on our web site.